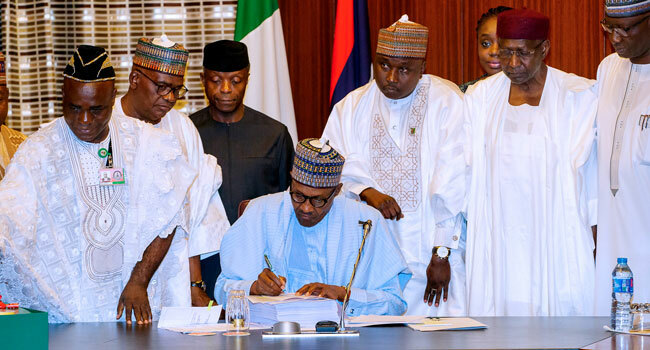 President Buhari Signs 2018 Budget – Royal Times of Nigeria. President Muhammadu Buhari has signed the 2018 Appropriation Bill into law. The President assented to the bill today at the Presidential Villa in Abuja, the Federal Capital Territory. In his remarks, President Buhari thanked the Senate President and the Speaker of the House of Representatives, and all the lawmakers for passing the 2018 Appropriation Bill. The president also accused the National Assembly of tampering with the 2018 budget sent to them by cutting essential projects and inserting non-essential ones. In his speech during the budget signing, President Buhari observed that the National Assembly made cuts amounting to 347 billion Naira in the allocations to 4,700 projects submitted to them for consideration and introduced 6,403 projects of their own amounting to 578 billion Naira. Meanwhile , the National Assembly leadership has spoken on the concerns raised by President Muhammadu Buhari on the manipulation of the 2018 budget estimates sent to the lawmakers. Alhassan Doguwa, who represented Speaker Yakubu Dogara, said the lawmakers had no option than to tinker with the budget estimates. The senator also said they decided to alter the budget in order to balance between the six geo political zones across the country noting that the balancing efforts by the National Assembly led to the observations raised by President Buhari.